Ballymena United skipper Jim Ervin says the objective of Friday night’s Danske Bank Premiership clash against Linfield is keep the gap between themselves and third placed Crusaders. The Blues are nine points clear of United as the top of the league standings before the clash. And with only five games to the end of the campaign Ervin says the Sky Blues focus is on getting three points as they they look to stay in second place in the league. “We are just looking to cement second place and Crusaders are only four points behind us, so we are looking to maintain that gap over the weekend. And Ervin admits it will be a tough test against David Healy’s side at the Warden Street venue. “They are a very good side and they are not nine points clear at the top of the table for no reason. “They have been consistent and they are top of the league because they are a good side. “They have been the best team so far, so we know it is going to be a difficult game but it is one we have been looking to. “We lost against Glentoran and then we bounced back against Institute. We then went flat again by losing to Warrenpoint. “It is important we get back to winning ways as quickly as possible. And the game against Linfield will be tight as it’s first against second. “It is going to be a tough game but I think it will be a good game as they have all been good games so far this season. “We are just looking forward to it and we want to get a good result,” said Ervin. And Linfield manager David Healy wants his side to kick-on after their 5-0 win against Dungannon Swifts and he believes the wee break for the Irish Cup semi-finals last weekend has done his players good. “The players had earned a wee break and hopefully we can come back into the same level of performance and the attitude we had against Dungannon and go to Ballymena which is a big game for the club. And Healy says he was pleased with his side’s performance against the Swifts. “I was really pleased with the performance against Dungannon and it was probable our most dominant performance for a number of weeks. “Getting the early goal helps and we didn’t get them against Institute and that game became a little bit edgy. “It didn’t happen against Dungannon and it was small pitch but conditions were fine. “The players from minute one to minute 92 against Dungannon were excellent and they can take credit from that. 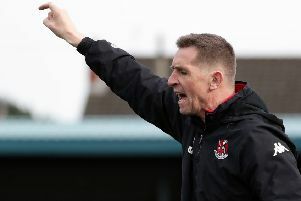 And the Linfield manager and former Northern Ireland international believes his side can play better than they did against the Swifts but at this stage of the season three points is all that matters as they try to get their hands on the Gibson Cup. “I think we have played better at times and not got the dominant score line but I am happy to have won the game. “If we had gone down to Dungannon, played poorly and won 1-0 you still only get three points. But it is easier on the players and it is easier on my nerves. And winning by the margin we did means the fans don’t get edgy.